Adrian Garcia is one of the 7 candidates participating in our debate September 10. 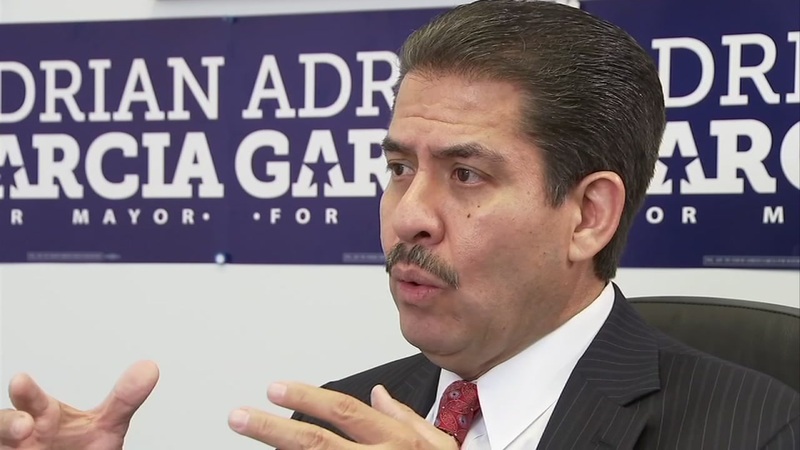 HOUSTON (KTRK) -- Adrian Garcia has had a long career in public service, and now he wants to keep it going by becoming the next mayor of the city of Houston. As we count down to next week's first televised mayoral debate, we're taking a closer look at the candidates. Garcia began his career as an officer, was later elected to city council, then ran for Harris County sheriff and easily won. Now he's looking for the city's top job. "If you get into office, what are the three most pressing issues you need to address immediately?" we asked him. "Making sure on day one, we start to create a dialogue and start a process to address the $126 million gap that we think we are stepping into," he said. The city of Houston's revenue cap limits tax revenue to the combined rates of inflation and population. It essentially limits the amount the city can raise taxes. "What do you think about the revenue cap?" we asked. "I voted for the revenue cap when I was on council," he said. "And I think citizens still want there to be some degree of fiscal discipline in city hall. I think we need to make adjustments to it, just like I did when I was on council in '06 when I realized we need to make a $90 million adjustment to it. We went to the voters. The voters gave it our approval. So I think it can merit some adjustment in that regard." "What do you think about public safety in the city? Do you feel we're OK with our current number of police officers on the street or do you feel that needs to be increased to any degree?" "We ought to be looking for ways to do more with what we have, at least initially," he said. "Using technology, making sure our real-time crime center is as contemporary as it was when we first did it, when I was on council, making sure we are leveraging apps like we did when at the sheriff's office." You can watch the full Adrian Garcia interview online below. We will profile the mayoral candidates leading up to the first televised mayoral debate. ABC-13 is co-hosting the debate with Univision on September 10. We will live stream the debate on our website at 6pm that evening and broadcast it on ABC-13 at 10:35pm that same night.